Our jewel in the crown. The Statesman snooker table would grace the most elegant snooker room. A solid looking appearance, enhanced by the 9.5” diameter legs and the carved mouldings on the cushion panel. This is possibly the best snooker table made today worldwide. 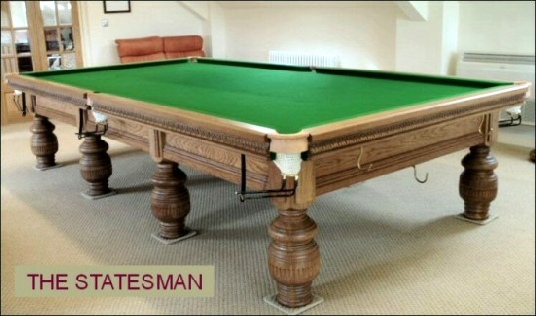 The Statesman snooker table made by Alan Phillips Snooker. When only the best will do. Suppliers of snooker and pool tables. See our Statesman Snooker Table with matching shade.